When you visit New Zealand part of the true experience is to immerse yourself in the culture. New Zealand is one of the best places in the world to do this. We have a rich and fascinating history involving the Maori, the indigenous people of NZ. Below I’ve listed some of my favorite Maori culture experiences in New Zealand. A free attraction you can visit that combines traditional Maori culture and Tudor influences from when the British arrived in Rotorua. Ohinemutu is a Maori settlement nestled on the shores of Lake Rotorua. 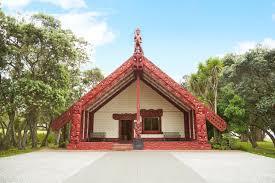 Here you can visit Maori settlements with some information about the area. See the famous St Faiths Church which combines Tudor and Maori architecture. It is truly beautiful. It’s free to visit and worth checking out when you visit Rotorua. The New Zealand culture experience has to be one of the best in the world simply due to the wealth of different opportunities we have to experience it. When you visit try to immerse yourself in as much of our history and culture that you can, you really won’t regret it. BACKGROUND Bachelor of Communications, Media, Radio star, Tour Guide, Has a background of talking far too much so fits in pretty nicely.